In an update to a support document on Friday, Apple offers details on the changes and improvements —including expanded display compatibility —made to 4K monitor support under the company's latest OS X Mavericks 10.9.3 release. According to Apple's "Using 4K displays and Ultra HD TVs with Mac computers" support page, the latest OS X 10.9.3 version can pump out a 30 Hz picture over single-stream transport (SST) to Dell's UP2414Q and UP3214Q displays, as well as Panasonic's TC-L65WT600. This function was previously limited to Sharp's PN-K321 and the ASUS PQ321Q. Further, the late 2013 MacBook Pro with Retina display and late 2013 Mac Pro now support the above displays at 60 Hz refresh rates using multi-stream transport (MST). The support document offers instruction on how to get the 4K screens to function accordingly, since most ship with MST turned off by default to enhance compatibility with older computers. In addition to the expanded display support, Apple also offers instruction on adjusting attached screens to best fit content to available real estate. 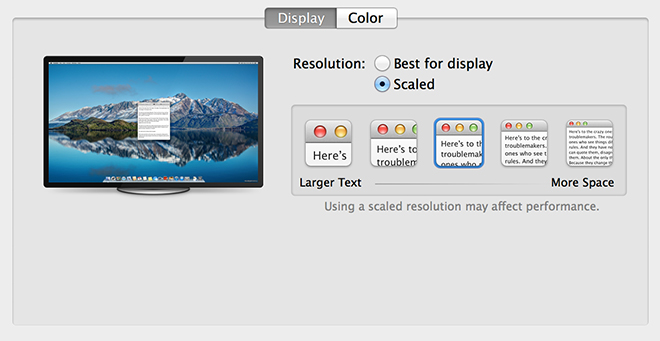 As seen in the graphic above, which is a screenshot of OS X 10.9.3's Display Settings, Apple now uses an icon-based scaling selection user interface instead of just showing screen resolution numbers. With the latest OS X Mavericks 10.9.3 release, Apple is quickly bringing its Mac operating system up to date with its latest hardware like the Retina MacBook Pro and redesigned Mac Pro.